Fantastically thick hair is a blessing, but styling it can be a battle. With the ghd Gold Max Styler you’ll triumph every time. Larger plates instantly tame the fiercest curls, the longest locks and Afro-Caribbean hair; letting you create your style in no time. With the ghd Gold Max Styler, turning your hair from wonderfully wild to poker-straight perfection is an effortless task. Beautiful curls, sensuous waves and fantastic flicks in no time – all from the sleekest, most glamorous ghd styler yet. There’s no more beautiful way to show unruly hair who’s boss. Arriving in a luxurious gift box, the ghd Gold Max Styler comes complete with a protective heat guard to protect you, your irons, and your surfaces after styling. Luxurious plates smooth your hair for an ultra-shiny result. 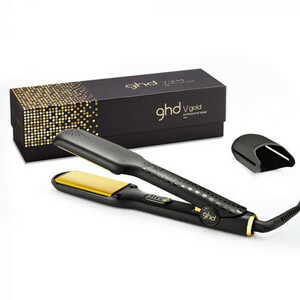 The ghd golden plates have been contoured and given a high-gloss finish to glide through hair. With its improved outer body, the ghd Gold Max Styler stays cooler to the touch for longer and is lighter to handle. * Sleek design: allows for better handling for all types of styling. * Protective plate guard: to safely cover hot plates when you need to style and go. * Ceramic heaters and contoured plates: glide through your hair for smoother, snag-free styling. * Rounded barrel: easily create curls, waves, flicks and perfectly straighten. * Sleep mode: heaters automatically switch off if not used for 30 minutes. * Universal voltage: optimum performance wherever you travel. NOTICE: the ironing plates are deliberately curved to ensure a smooth glide and good performance during ironing. Curved plates aren't defect, but the benefit in the form of easy and smooth ironign of hair. Do you need help with choosing of hair straightener? Read ours instruction → How to Choose the Best Hair Straightener for Your Hair?